Are you afraid they might swim to Turkey?” a young Georgian man jests in response to Soviet border guards, upon their announcement of the beach’s nightly curfew. His friends swim in a watery foreground, framed by the dusty blue of the Black Sea’s oceanic horizon. 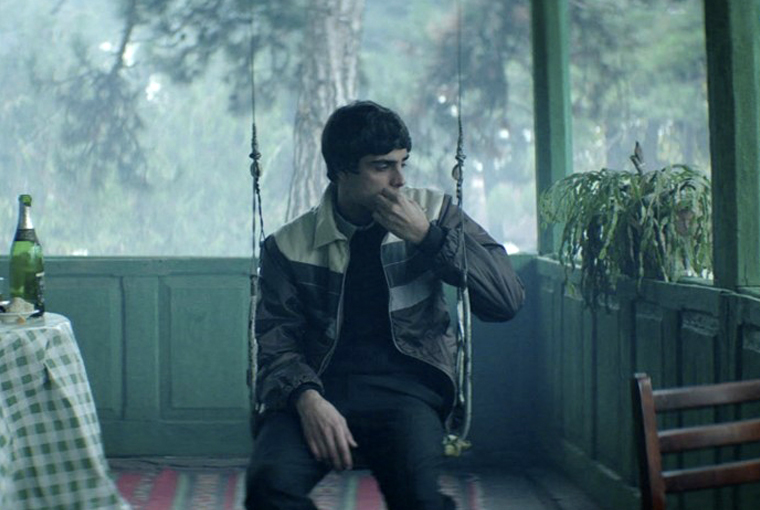 The oscillation between longing and anxiety aroused by borders, both geographical and psychological, is poetically ciphered into this scene of leisure and its discipline, which opens Hostages by Georgian director Rezo Gigineishvili. Gigineishvili presents a filmic portrait of the attempted hijacking of Aeroflot Flight 6833 from Tbilisi to Leningrad via Batumi in 1983 by a group of young Georgian citizens of the Georgian Soviet Socialist Republic—an event that remains controversial across various thresholds of cultural memory. Through an intimate depiction of the intertwined protagonists and a lyrical narration of the events that preceded and followed the hijacking, Hostages preserves the ambivalent admixture of the repression of Communist rule, a young generation’s dream of leaving the Soviet Union, and the violent ends of their utopian enactment. The Tbilisi hijacking of 1983 was an attempt by a group of young Georgians—doctors, painters, art students, actors, all children of the Georgian intellectual elite—to overtake a Batumi-bound flight. With the intention of forcing the pilot at gunpoint to divert the plane to a landing in Turkey, the young Georgians envisioned an escape from the Soviet Union against its ban from traveling abroad. The hijacking was nonetheless unsuccessful, erupting in violence onboard, the plane’s return to Tbilisi, and the consequent trial and execution of the hijackers. The highlight of Hostages is its unsettling of such a linear recounting of the event’s facts and their stable subject positions of perpetrators and victims. Instead, Gigineishvili presents an oblique, fragmented narrative that simultaneously conceals and reveals the planning of the hijacking. Short segments compose the chilling storyline through encoded images, such as a KGB officer warning a professor to look after his son, the symbolic repetition of “American cigarettes” and a Beatles record as objects of fantasy from an imagined West, and various domestic interiors that signal the overbearing proximity of parental presence. These disjunctive sequences, of scenes endowed with ulterior motives, point to the circulation of secrets, surveillance, longing, and control, which together surface into a plan of escape to an idealized West from the repressiveness of home and cultural life in Soviet Georgia. By privileging atmospheric image-sequences and veiled symbols over direct historical illustration, Hostages takes no stance towards justifying or apologizing for the violence incurred. Rather, the young Georgians’ yearning to transcend their sense of being stifled (and the entrapment they project onto the privileged lives of their parents) becomes magnified, and eventually distorted, into a fantasy of exodus from the Soviet Union at all costs. After multiple extended shootouts, by both the hijackers during the flight and by Soviet forces upon the plane’s forced re-landing in Tbilisi, the utopian dream of escape evaporates amidst the senselessness of excess violence. “I didn’t mean to pay this price for my freedom,” Anna (played by Tina Dalakishvili), a surviving conspirator, tearfully testifies in the courtroom. Upon their trial, the young Georgians are declared as “parasites who did not want to stay in their country,” while in an assembly at the art academy, they are deemed “not citizens of the homeland.” Beyond its original affordance of geographical confinement, the nation is further instrumentalized as an apparatus of legal and psychological exclusion, and the hijackers are sentenced to death—the unknown locations of their burial sites traumatizing their parents. By simultaneously isolating, fragmenting, gradually revealing, and re-contextualizing the hijacking, Gigineishvili thus situates the event’s brutality amidst a broader milieu of administrative repression and legal violence in Soviet Georgia. Upon the landing of the plane back in Tbilisi after the airborne massacre, Hostages flashbacks to the opening scene of the young Georgians swimming in the Black Sea, waves breaking ashore as they swim outwards. The grainy analogue texture of the joyful flashback signifies its irrevocable loss amidst the passage of time and the descent into bloodshed. The vision of the Black Sea interrupts the expected sequencing and rehabilitates the film’s image of freedom, which paradoxically ended in violence on both sides—of the hijackers and of the systems of authority and punishment to which they are confined. The Black Sea flashback thus upholds the figment of utopian return suspended in the linear inevitability of the hijacking’s failure and its aftermath of doom, guilt, imprisonment, and execution. The most evocative dimension of Hostages is that it both humanizes and estranges the Tbilisi hijacking, evoking empathy for the protagonists’ hopes and desires while staging the inability of justifying their aggressive realization. In doing so, Rezo Gigineishvili’s Hostages simultaneously portrays the tangibility of dreams, their hubristic nullification through violence, and the pathos of combating violence with more violence.